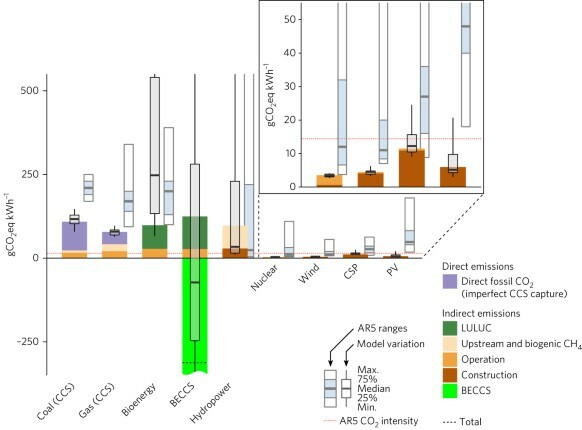 Different low carbon technologies including wind and solar energy, and fossil carbon capture and sequestration (CCS) differ greatly when it comes to indirect greenhouse gas emissions in their life cycle. This is the result of a comprehensive new study conducted by an international team of scientists, now published in the journal Nature Energy. Contrary to some arguments, the researchers found that wind and solar energy are more favorable when it comes to life-cycle emissions. They also show that a full decarbonization of the global power sector by scaling up these technologies would induce only modest indirect greenhouse gas emissions—and hence not impede the transformation towards a climate-friendly power system. "Both fossil and non-fossil power technologies still come with a certain amount of greenhouse gas emissions within their life cycle—on the one hand, because constructing and operating them requires energy. On the other hand, because of methane emissions, e.g. from coal and gas production," explains lead author Michaja Pehl. "However, we found there are substantial differences across technologies regarding their greenhouse gas balance. Electricity production from biomass, coal, gas and hydropower, for instance, induces much higher indirect greenhouse gas emissions than nuclear electricity, or wind and solar-based power supply." With their study, the researchers provide an innovative and comprehensive global analysis of embodied energy use and indirect greenhouse gas emissions from all relevant power sector technologies. For the first time, their study combines the strengths of simulations based on integrated energy-economy-climate models that estimate cost-optimal, long-term strategies to meet climate targets with life cycle assessment approaches. So far, these research branches have operated separately. 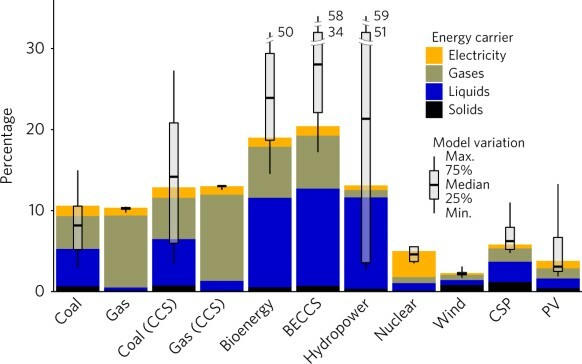 Exploring the life cycle emissions of future low-carbon supply systems and the implications for technology choices, they found that fossil power plants equipped with CCS will still account for life-cycle emissions of around 100 grams of CO2-equivalents per kWh of electricity produced, 10 times more than the around 10 grams of CO2-equivalents for wind and solar power they project for 2050 in a climate protection scenario in which power production is almost completely decarbonized. "There is no such thing as truly clean coal. Conventional coal power currently comes with around 1000 grams of CO2-equivalents per kWh. Capturing CO2 from coal plants can reduce emissions per kWh by around 90 percent, but substantial life-cycle greenhouse gas emissions remain," says Gunnar Luderer, energy system analyst from PIK and project leader. "To keep global warming below 2°C, however, virtually carbon free electricity is necessary. This makes it increasingly implausible that coal power will play a major role in the future, even if equipped with CO2 scrubbers." "When it comes to life cycle greenhouse gas emissions, wind and solar energy provide a much better greenhouse gas balance than fossil-based low carbon technologies, because they do not require additional energy for the production and transport of fuels, and the technologies themselves can be produced to a large extend with decarbonized electricity," states Edgar Hertwich, an industrial ecologist from Yale University who co-authored the study. Due to technological innovation, less energy will be needed to produce wind turbines and solar photovoltaic systems. "Some critics have argued renewable energies could come with high hidden greenhouse gas emissions that would negate their benefits to the climate. Our study now shows that the opposite is true," concludes Luderer. "During the transition to clean power supply, the additional life-cycle emissions for building up wind and solar capacities are much smaller than the remaining emissions from existing fossil power plants before they can finally be decommissioned. The faster the low-carbon transformation of power supply is accomplished, the lower is the overall remaining carbon burden for the climate." The report figures show that nuclear power has the lowest specific CO2 equivalent cost. Fig. 2: Specific direct and indirect GHG emissions. Mosts of the embedded energy cost of nuclear power comes from its upkeep and operation, in the form of electricity - which makes the GHG cost drop further as the electricity is generated cleanly. Fig. 1: Embodied energy use of electricity production as a percentage of lifetime electricity production. Meanwhile, wind and solar power generation costs are mostly in the construction phase, which is difficult to clean up since mining, refining, and transporting, and the land construction runs on fossil fuels. It's coal and diesel all over. Eikka, you have apparently misinterpreted the data in the links you provided. While your view of the role of future nuclear power generation possibilities is somewhat accurate, your behavior with regard to renewables is decidedly troll-like. Eikka, you have apparently misinterpreted the data in the links you provided. Well, provide the correct interpretation then. your behavior with regard to renewables is decidedly troll-like. If it's trolling to tell the truth nobody wants to hear, then fol-de-rol indeed. "To keep global warming below 2°C, however, virtually carbon free electricity is necessary." Alright, so the article pitches wind and solar power to the fore and does its best to avoid giving any information about nuclear power beyond mentioning it. Meanwhile the actual paper shows that nuclear power is the best option out of the three on the GHG criteria. Why ignore it like that? Smells exactly like a political agenda. and the technologies themselves can be produced to a large extend with decarbonized electricity,"
Which is largely untrue for the moment, and arguably in the future as electric transportation (battery-electric vehicles) are failing the market. For example, refining silicon out of sand uses a chemical process involving carbon, which comes from natural gas. Setting down concrete foundations releases CO2. Trucking tens of thousands of turbines/PV-panels around is done on ships and trucks running on oil and diesel etc. etc. Glad you recognize your troll like negativism Eikka. I support nukes from a C02 perspective - you are correct - they are very close to wind and solar. The cost of the electricity is the problem there. "Which is largely untrue for the moment, and arguably in the future as electric transportation (battery-electric vehicles) are failing the market." Where do you live? Come to my neighborhood! We now have TWO electric vehlcles and the PV system to run them and the entire household. In Feb we get the Tesla batteries. The future will eventually get to you, too.